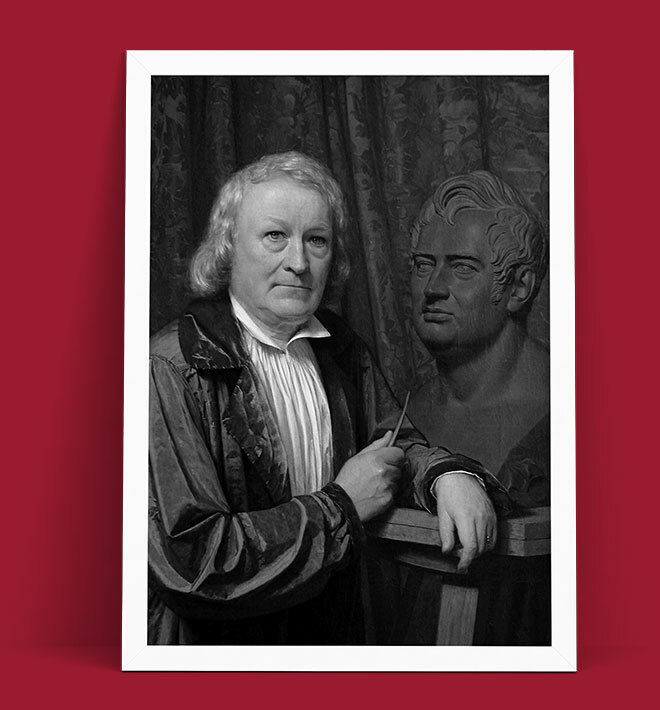 Bertel Thorvaldsen (1770-1844) was next to Antonio Canova the most important sculptor of Classicism in Europe. He became one of the most famous Danish artist. Most of his life he spent in Italy. Albert Bertel Thorvaldsen was born on November 19, 1770 in Norway as son of an Island woodcarver named Gotskalk Thorvaldsen and his wife Karen Dagnes. He got educated by his father, but after his talent was recognized, he attended the Royal Academy of Arts at the age of eleven. His master was Nicolai Abraham Abildgaard. Bertel Thorvaldsen was next to Antonio Canova the most important sculptor of Classicism in Europe. He became one of the most famous Danish artist. Most of his life he spent in Italy. was next to Antonio Canova the most important sculptor of Classicism in Europe. He became one of the most famous Danish artist. Most of his life he spent in Italy. In 1787 he got honoured with the small silver medal for his talent and his work. Two years later he was honoured with the big silver medal for another sculpture he executed. After finishing a relief in 1791 he got honoured again and in 1793 he got the big gold medal for the relief of St. Peter. Furthermore he attracted the attention of Christian Frederick Reventlow, who became one of his patrons. The Royal stipend allowed him to move to Rome and to stay there for the least three years. But Bertel Thorvaldsen did already some commissioned work; leaving immediately was impossible. In August 1796 he finally started travelling to Rome, but arrived not until March 8, 1797 because he stopped in Malta and Naples. Finally arrived in Rome, he created several sculptures he sent the figure "Bacchos and Ariadne" to Copenhagen. The Academy agreed to renew his stipend for three more years. During this time he met the sculptors Franz Pettrich and Carl Friedrich Hagemann and he also got in touch with Thomas Hope, who charged him with creating the sculpture Jason. The years 1801 until 1803 were marked of poverty and political unrest. In 1815 the artist felt into a crisis and pulled out to Montenero. Suffering his creative crises he was still creating sculptures, at least some of his best ones. In 1818 he went back to Norway and become a professor at the Academy of Art. In 1920 he left his home country and travelled through Austria, Poland and Germany, then back to Italy. In Italy he executed his most popular works: A bronze monument for Nicolaus Copernikus and a memorial for Pope Pius VII. The next years he spent in Denmark and in Italy where he did some requested work. His last station was Copenhagen, where he broke down during a theatre performance; he died the same night on March 24, 1844 in Copenhagen. Thorvaldsen`s sculptures still enjoy a high reputation. The importance of his work lies especially in the resuscitation of the idyll of ancient art. Many of his works are exhibited Thorvaldsen Museum in Kopenhagen. Thorvaldsens classical style was strict; nevertheless his contemporaries saw his works as the ideal, although afterwards art took new directions. A bronze copy of Thorvaldsen`s Self-Portrait stands in Central Park, New York, near the East 97 Street entrance. In our shop you can find high quality replica like Jason with the Golden Fleece and Zeus on a marble base. Moreover we have an exhibit of the famous statue Hebe. Visit our shop.